He was frail. Vulnerable. In the hopeless pursuit to find a balance between his failing heart and declining kidneys, he had lost the will to make it to his appointments. Although disheartened, he turned up every month to see me. He masked his fear of the inevitable with cognitive medical discussions, trying to defer conversations about his goals of care. But it finally happened. I broached the subject. He shared. I listened. In the end, he opted for the conservative route. Palliative care is often mistaken to be synonymous with end-of-life care, albeit it encompasses much more. Better represented by the term “Supportive Care,” it focuses on providing holistic care and an extra layer of support to patients with chronic illnesses. This includes caring for patients from as early as the time of their diagnosis, aiming at alleviating symptoms, enhancing quality of life, addressing psychosocial, existential, and spiritual concerns and also assisting in decision-making throughout the course of their disease. As renal physicians we pride ourselves on being able to treat complex metabolic problems, understand challenging hemodynamics, and offer life-prolonging treatment modalities. However, our role as nephrologists extends beyond calculations and correcting electrolytes. We support our patients throughout their illness, from early stages through renal replacement therapy (RRT) until their death. Our patients are aging, they suffer a significant symptom burden, and are shying away from aggressive treatments to preserve their quality of life. This makes it imperative that we empower ourselves with skills that would allow us to provide the best possible care to our patients, in alignment with what matters to them. The growing recognition for the need to integrate supportive and palliative care into the care of renal patients reflects a paradigm shift towards this direction. An additional need of the hour is to train our future generations in palliative care, advance their communication skills, and build proficiency in providing end-of-life care, including withdrawal of dialysis. For successful care no longer lies in mere prolongation of life, rather in helping one live a life that matters, and allowing a dignified death. Ritu Soni, MD, is an Assistant Professor in the Division of Nephrology and Palliative Care at UMass Memorial Medical Center, MA. She completed her medical schooling at M.S. University in Baroda, India. She trained in Internal Medicine and went on to complete a fellowship in Nephrology at University of Pittsburgh Medical Center (UPMC). She served as the chief renal fellow during her fellowship. She also completed a fellowship in Hospice and Palliative Medicine at UPMC. Her educational and clinical interests include promoting supportive care for patients with kidney diseases. Additionally, she is interested in developing innovative methods of teaching to advance nephrology education. 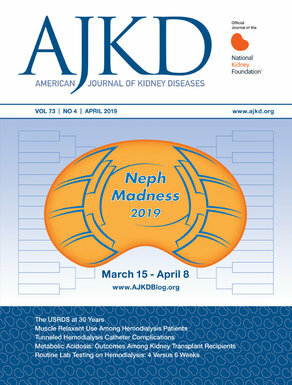 She introduced the Nephrology Jumble Bumble, which is an anagram-puzzle for self-assessment and is published on the AJKD Blog.